Home » Newsletter sign up » Around the World in 80 Plants – the inspiring edible adventure! A thorough description is given of each vegetable, its propagation, cultivation and uses, and also how to source seed and plants. As many of the author’s selections are what he calls ‘edimentals’ – edible and ornamental – Around the World in 80 Plants will be of interest to traditional ornamental gardeners as well as anyone interested in permaculture, forest gardening, foraging, slow-food, gourmet cooking, traditional preservation techniques and ethnobotany. Stephen Barstow presents fascinating and useful information about his top 80 perennial leafy vegetables including lots of historical references, his and others’ recipe ideas, along with photos and more. Many of these are easily grown and can be ornamental as well as great edibles. This will be a really useful book helping extend the range of food plants for gardeners. Martin Crawford, Agroforestry Research Trust. Around the World in 80 Plants is more than just excellent profiles of little-known delicious vegetable crops. Stephen Barstow is one of the world’s great edible plant collectors and his stories of encountering plants in the wild, tracking down seeds of rare species, and of course growing and cooking with these species are absolute treasure. Many plant books just rehash information already written in other sources. 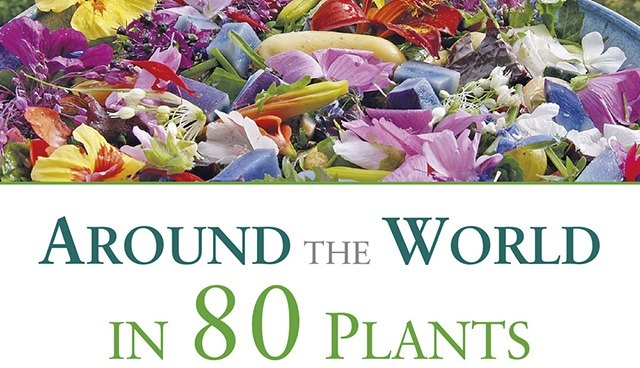 Around the World in 80 Plants is delightfully marinated in personal experience. It will make you not only want to grow and eat these crops, but to travel to Siberia, Norway, and Chile to know them in their natural habitat.